Eugene Madsen is an Associate Professor in the Department of Microbiology at Cornell University. He has taught university courses in environmental microbiology for over a decade and serves as a member of the editorial board of several journals, including Applied and Environmental Microbiology, Geomicrobiology, and Applied Microbiology and Biotechnology. Madsen has also served as a member of two National Academy of Sciences committees on In situ Bioremediation. 1. Significance, History, and Challenges of Environmental Microbiology. 1.1 Core concepts can unify environmental microbiology. 1.2 Synopsis of the significance of environmental microbiology. 1.3 A brief history of environmental microbiology. 1.4 Complexity of our world. 1.5 Many disciplines and their integration..
2. Formation of the Biosphere: Key Biogeochemical and Evolutionary Events. 2.1 Issues and methods in Earth’s history and evolution. 2.2 Formation of early planet Earth. 2.3 Did life reach Earth from Mars? 2.4 Plausible stages in the development of early life. 2.5 Mineral surfaces: the early iron/sulfur world could have driven biosynthesis. 2.6 Encapsulation: a key to cellular life. 2.7 A plausible definition of the tree of life's "last universal common ancestor". 2.8 The rise of oxygen. 2.9 Evidence for oxygen and cellular life in the sedimentary record. 2.10 The evolution of oxygenic photosynthesis. 2.11 Consequences of oxygenic photosynthesis: molecular oxygen in the atmosphere and large pools of organic carbon. 2.12 Eukaryotic evolution: endosymbiotic theory and the blending of traits from Archaea and Bacteria. 3. Physiological Ecology: Resource Exploitation by Microorganisms. 3.1 The cause of physiological diversity: diverse habitats provide selective pressures over evolutionary time. 3.2 Biological and evolutionary insights from genomics. 3.3 Fundamentals of nutrition: carbon- and energy-source utilization provide a foundation for physiological ecology. 3.4 Selective pressures: ecosystem nutrient fluxes regulate the physiological status and composition of microbial communities. 3.5 Cellular responses to starvation: resting stages, environmental sensing circuits, gene regulation, dormancy, and slow growth. 3.6 A planet of complex mixtures in chemical disequilibrium. 3.7 A thermodynamic hierarchy describing biosphere selective pressures, energy sources, and biogeochemical reactions. 3.8 Using the thermodynamic hierarchy of half reactions to predict biogeochemical reactions in time and space. 3.9 Overview of metabolism and the "logic of electron transport". 310 The flow of carbon and electrons in anaerobic food chains: syntrophy is the rule. 3.11 The diversity of lithotrophic reactions. 4. A Survey of the Earth’s Microbial Habitats. 4.2 Soils: geographic features relevant to both vegetation and microorganisms. 4.4 Subsurface habitats: oceanic and terrestrial. 4.5 Defining the prokaryotic biosphere: where do prokaryotes occur on Earth? 4.6 Life at the micron scale: an excursion into the microhabitat of soil microorganisms. 4.7 Extreme habitats for life and microbiological adaptations. 5. Microbial Diversity: Who is Here and How do we Know? 5.1 Defining cultured and uncultured microorganisms. 5.2 Approaching a census: an introduction to the environmental microbiological "toolbox". 5.3 Criteria for census taking: recognition of distinctive microorganisms (species). 5.4 Proceeding toward census taking and measures of microbial diversity. 5.5 The tree of life: our view of evolution's blueprint for biological diversity. 5.6 A sampling of key traits of cultured microorganisms from domains Eukarya, Bacteria, and Archaea. 5.7 Placing the "uncultured majority" on the tree of life: what have nonculture-based investigations revealed? 5.8 Viruses: an overview of biology, ecology, and diversity. 5.9 Microbial diversity illustrated by genomics, horizontal gene transfer, and cell size..
6. Generating and Interpreting Information in Environmental Microbiology: Methods and their Limitations. 6.1 How do we know? 6.2 Perspectives from a century of scholars and enrichment-culturing procedures. 6.3 Constraints on knowledge imposed by ecosystem complexity. 6.4 Environmental microbiology’s "Heisenberg uncertainty principle": model systems and their risks. 6.5 Fieldwork: being sure sampling procedures are compatible with analyses and goals. 6.6 Blending and balancing disciplines from field geochemistry to pure cultures. 6.7 Overview of methods for determining the position and composition of microbial communities. 6.8 Methods for determining in situ biogeochemical activities and when they occur. 6.9 Metagenomics and related methods: procedures and insights. 6.10 Discovering the organisms responsible for particular ecological processes: linking identity with activity. 7. Microbial Biogeochemistry: a Grand Synthesis. 7.1 Mineral connections: the roles of inorganic elements in life processes. 7.2 Greenhouse gases and lessons from biogeochemical modeling. 7.3 The "stuff of life": identifying the pools of biosphere materials whose microbiological transformations drive the biogeochemical cycles. 7.4 Elemental biogeochemical cycles: concepts and physiological processes. 7.5 Cellular mechanisms of microbial biogeochemical pathways. 7.6 Mass balance approaches to elemental cycles. 8. Special and Applied Topics in Environmental Microbiology. 8.1 Other organisms as microbial habitats: ecological relationships. 8.2 Microbial residents of plants and humans. 8.5 Evolution of catabolic pathways for organic contaminants. 8.6 Environmental biotechnology: overview and eight case studies. 9. Future Frontiers in Environmental Microbiology. 9.1 The influence of systems biology on environmental microbiology. 9.2 Ecological niches and their genetic basis. 9.3 Concepts help define future progress in environmental microbiology. If you are unable to view the PDF file, you can download the free reader from Adobe. The artwork for this chapter and the others below are stored in ZIP archives. You may require "Winzip (PC) or "Stuffit Expander" (Mac) to access these files. The tables for this chapter and the others below are stored in ZIP archives. You may require "Winzip (PC) or "Stuffit Expander" (Mac) to access these files. 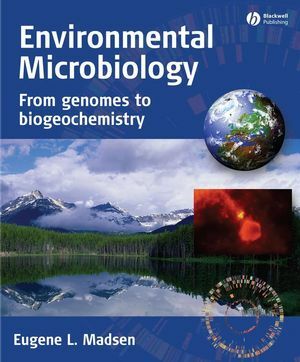 The Instructor's Manual for the Environmental Microbiology text by Eugene Madsen is available FOR INSTRUCTORS by contacting Eugene Madsen at elm3@cornell.edu. Please accompany your request for the PDF version of the manual with a brief description of the course you are teaching, its website link (if available), your own institutional website, your email address, and/or another justification for receiving the manual. Our goal is to assure the manual's usefulness by excluding access to students enrolled in courses using the textbook. Filled with new and original, inquiry-driven facts, principles, and perspectives derived from genomics, earth science, and biotechnology.